Discuss, review and rate The Girl from Auntie, produced c. Monday 4th October 1965 to c. Saturday 23rd October 1965. This is a most humorous Avengers episode, and this is done at a high level, because a lot of witty moments. I like Georgie as a replacement for Emma Peel, although in any case, if there were more of her adventures with Steed, it seems the show would became a sort of sitcom. In some sense IQ of Georgie like Penelope from episode Dead Man's Treasure, but it lends a certain charm for dialogues and development of events. 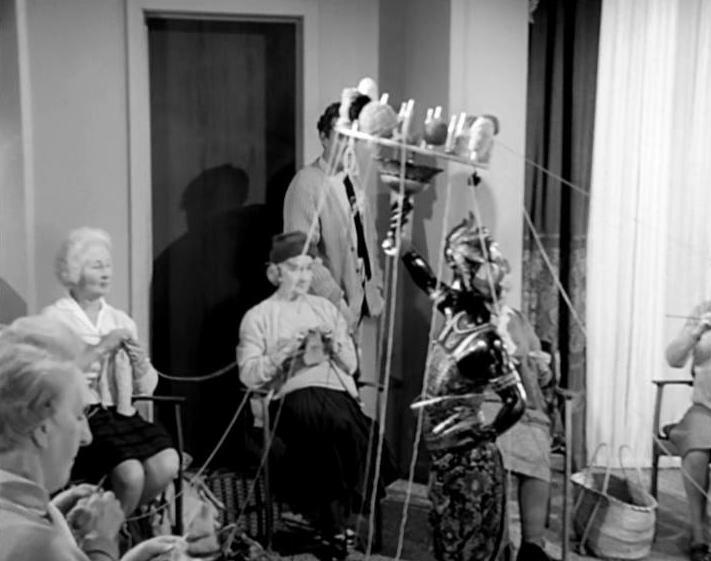 Statue in the knitting circle was used earlier in the house of Dr Gibson in the episode "Small Game for Big Hunters". Leaves me struggling to stay awake every time I try to watch it. I've always had a huge dislike of this episode, in fact I don't think I've ever seen it right through from start to finish in one go. Hugely boring in every respect, which isn't helped by the absence of Emma Peel throughout most of it. I always found the sight of Peel dressed as a bird and sat in a cage slightly humiliating for Rigg. It also always reminds me of the time I met Liz Fraser at a convention, frankly the most unpleasant encounter with an actor from the series I've ever had. It also always reminds me of the time I met Liz Fraser at a convention, frankly the most unpleasant encounter with an actor from the series I've ever had. Yes I would like to hear more about the meet with Liz Fraser as well! Always thought she was drop dead gorgeous with a perfect figure and love this episode, one of the few I watch out of sequence when I am going through my collection.